Edmonton’s transportation master plan lays out some ambitious goals for the city. It signals the need to encourage downtown development, better integrate the city’s suburbs, reduce car use and congestion, and raise the economic efficiency of the City’s transportation. A key way the City of Edmonton plans to meet these goals is by expanding its Light Rail Transit (LRT) system from one line to six in order to encompass more of the city. Four of the proposed lines are considered extensions of the existing system, which has been taken to mean that the City itself should manage financing, operations, and maintenance. The expansion also consists of two new lines, and some have argued that these are suitable for a public-private partnership (P3) approach. 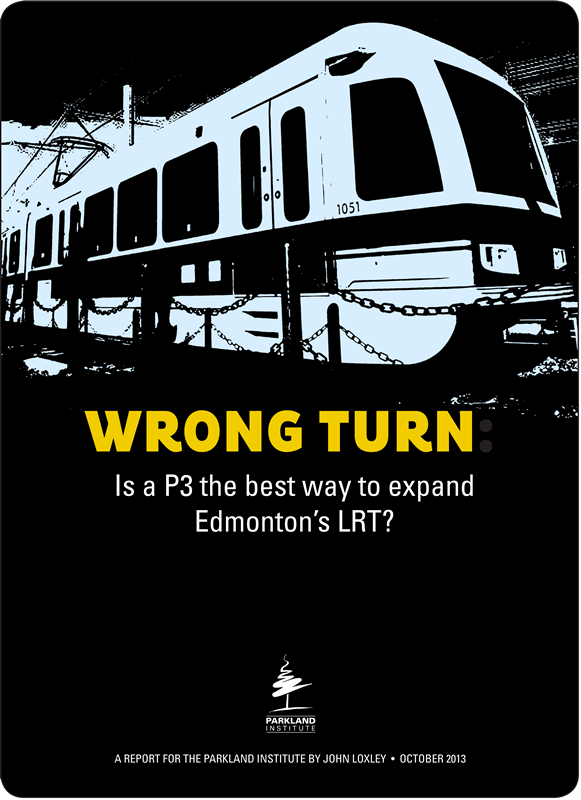 The City of Edmonton retained the consulting firm PricewaterhouseCoopers (PwC) to investigate the suitability of the P3 approach to the LRT extension. This report examines, insofar as possible, the data and analysis underlying three key reports prepared by PwC. Some of these reports focus specifically on the Southeast leg of the proposed Valley Line extension (often referred to as the Southeast Line), which is slated to soon move ahead. Notably, none of the reports have been made public in their entirety. The most important document, the business case, was accessed in severely redacted form through Alberta’s Freedom of Information and Protection of Privacy legislation. Indeed, the business case was so severely censored as to make it impossible to judge definitively whether the case for the P3 approach is valid. The secrecy surrounding the P3 proposal is troubling, unwarranted, and a breach of the City’s own policy. Unfortunately, significant concerns are raised even by what little data is publicly available. Contrary to how some P3 advocates have sought to portray the matter, use of new technologies neither necessitates nor justifies a P3. Indeed, a P3 approach has the potential to introduce problems of system coordination, and does not allow the City to build up the management capacity that will be needed in-house for further LRT expansions. PwC demonstrates the superiority of the P3 approach in part through comparisons to the value for money achieved in other Canadian P3s. Because of differences in how value for money is calculated, these comparisons cannot be accepted at face value. Proponents of a P3 approach have identified some BC projects as examples of what might be achieved here in Edmonton. However, a closer look at these projects make clear that they are not arrangements to emulate, given that they involve sacrifices in the quality of the infrastructure, and that their purported advantages may be nothing more than imaginary. What value for money the Southeast Line P3 is expected to achieve is largely found in operations, likely through the intended use of labour practices that threaten the well-being of workers. The methodology used by PwC to justify risk spreading to the private sector is open to criticism. Particularly, the assumption of large amounts of risk transfer should be examined with scepticism. A P3 arrangement would involve private financing, which is significantly more expensive than public borrowing. The use of private financing may cost the City of Edmonton $421 to $510 million (or $227 to $275 million in today’s money) more than if it borrowed the money directly. The present proposal is for the private sector to retain all profits from any future refinancing or equity flipping related to the LRT P3 project, positioning the private sector to achieve big gains while the City of Edmonton receives no benefit. The 30-year contract inherent to the proposed P3 arrangement raises important issues related to loss of flexibility for the City with respect to finance and operations. Notably, the public does not favour taking a P3 approach to expanding the LRT, largely due to concerns over lack of transparency, cost escalation, system integration, and loss of public accountability and service quality. After a thorough assessment of the available information, it is clear that there is ample reason to question whether proceeding to undertake the Southeast Line under a P3 arrangement will serve the public interest. The City of Edmonton should reconsider this approach.